Hot off the press: published article on Energy & Environmental Science! Written by Irene Anton on January 28, 2019 . Posted in New publications. The beginning of 2019 has been fruitful in terms of publications for the N&N group! Last 22nd January 2019 the article “Farming thermoelectric paper” was published on Energy & Environmental Science. This study has been carried out in collaborations with the NanOpto group at ICMAB. Congratulations to all the authors for this multidisciplinary work! Hot off the press: published paper on Nanoscale! Written by Irene Anton on November 13, 2018 . Posted in New publications. 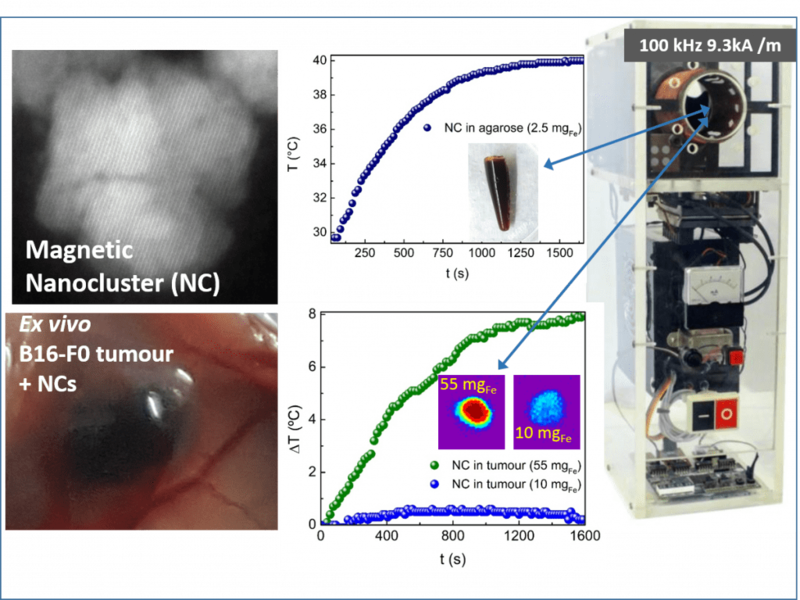 The paper entitled “Nanoclusters of crystallographically aligned nanoparticles for magnetic thermotherapy: aqueous ferrofluid, agarose phantoms and ex vivo melanoma tumour assessment” has recently been published on the Nanoscale Journal. We congratulate Anna Roig and our collaborator Marcela Fernández for being authors of this nice study! Abstract: Magnetic hyperthermia is an oncological therapy where magnetic nanostructures, under a radiofrequency field, act as heat transducers increasing tumour temperature and killing cancerous cells. Nanostructure heating efficiency depends both on the field conditions and on the nanostructure properties and mobility inside the tumour. Such nanostructures are often incorrectly bench-marketed in the colloidal state and using field settings far off from the recommended therapeutic values. 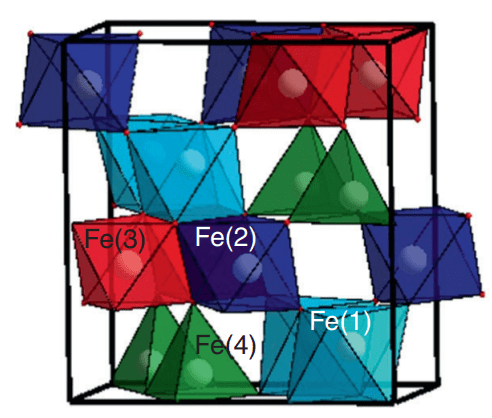 Here, we prepared nanoclusters composed of iron oxide magnetite nanoparticles crystallographically aligned and their specific absorption rate (SAR) values were calorimetrically determined in physiological fluids, agarose-gel-phantoms and ex vivo tumours extracted from mice challenged with B16-F0 melanoma cells. A portable, multipurpose applicator using medical field settings; 100 kHz and 9.3 kA m−1, was developed and the results were fully analysed in terms of nanoclusters’ structural and magnetic properties. A careful evaluation of the nanoclusters’ heating capacity in the three milieus clearly indicates that the SAR values of fluid suspensions or agarose-gel-phantoms are not adequate to predict the real tissue temperature increase or the dosage needed to heat a tumour. Our results show that besides nanostructure mobility, perfusion and local thermoregulation, the nanostructure distribution inside the tumour plays a key role in effective heating. A suppression of the magnetic material effective heating efficiency appears in tumour tissue. In fact, dosage had to be increased considerably, from the SAR values predicted from fluid or agarose, to achieve the desired temperature increase. These results represent an important contribution towards the design of more efficient nanostructures and towards the clinical translation of hyperthermia. Written by Irene Anton on May 29, 2018 . Posted in New publications. Congratulations to the authors Martí Gich, Anna Roig (N&N group), Pengfei Niu (former member of the N&N group) and César Fernández‐Sánchez (N&N collaborator form the Barcelona Institute of Microelectronics) for their published paper “Metal Nanoparticle Carbon Gel Composites in Environment in Water Sensing Applications”. The manuscript was published in the journal Chemical Record in a special issue dedicated to Prof. Ruiz-Hitzky. Abstract: The synthesis of organic‐inorganic nanocomposites that can interact with different environmental pollutants and can be mass‐produced are very promising materials for the fabrication of chemical sensor devices. Among them, metal (or metal oxide) nanoparticles doped conductive porous carbon composites can be readily applied to the production of electrochemical sensors and show enhanced sensitivity for the measurement of water pollutants, thanks to the abundant accessible and functional sites provided by the interconnected porosity and the metallic nanoparticles, respectively. In this personal account, an overview of several synthesis routes of porous carbon composites containing metallic nanoparticles is given, paying special attention to those based on sol‐gel techniques. These are very powerful to synthesize hybrid porous materials that can be easily processed into powders and thin films, so that they can be implemented in electrode fabrication processes based on screen‐printing and lithography techniques, respectively. 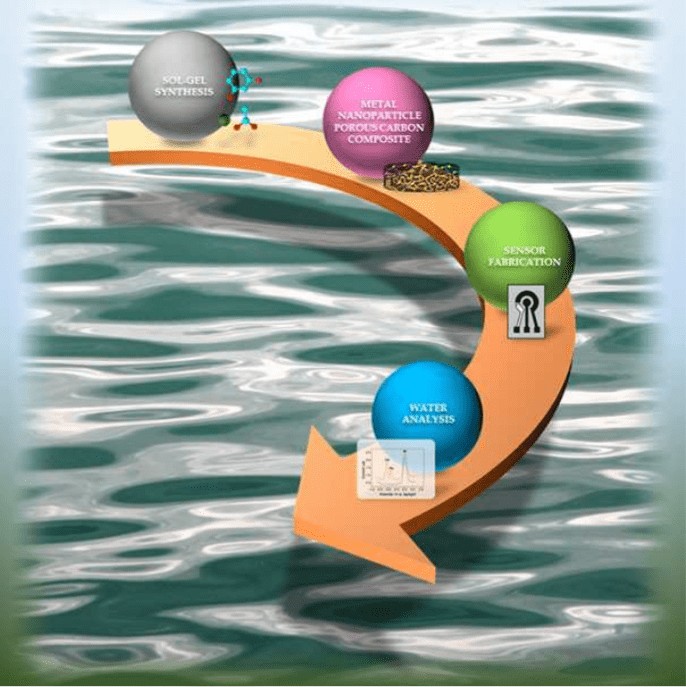 We emphasize the sol‐gel routes developed in our group for the synthesis of bismuth or gold nanoparticle doped porous carbon composites applied to fabricate electrochemical sensors that can be scaled down to produce miniaturized on‐chip sensing devices for the sensitive detection of heavy metal pollutants in water. The trend towards the miniaturization of electrochemical sensors to be readily employed as analytical tools in environmental monitoring follow the market requirements of rapid and accurate on‐site analysis, small sample consumption and waste production, as well as potential for continuous or semi‐continuous in‐situ determination of a wide variety of target analytes. Written by Irene Anton on May 2, 2018 . Posted in New publications. Congratulations to the authors: Anna Laromaine, Tina Tronser, Ivana Pini, Sebastià Parets, Pavel A. Levkin and Anna Roig for their new publication on Soft Matter. The paper entitled “Free-standing three-dimensional hollow bacterial cellulose structures with controlled geometry via patterned superhydrophobic–hydrophilic surfaces” was published on the 17th of April 2018. Bacteria can produce cellulose, one of the most abundant biopolymer on earth, and it emerges as an interesting candidate to fabricate advanced materials. Cellulose produced by Komagataeibacter Xylinus a bacterial strain, is a pure water insoluble biopolymer, without hemicelluloses or lignin. Bacterial cellulose (BC) exhibits a nanofibrous porous network microstructure with high strength, low density and high biocompatibility and it has been proposed as a cell scaffold and wound healing material. The formation of three dimensional (3D) cellulose self-standing structures is not simple. It either involves complex multi-step synthetic procedures or uses chemical methods to dissolve the cellulose and remold it. Here we present an in situ single-step method to produce self-standing 3D-BC structures with controllable wall thickness, size and geometry in a reproducible manner. Parameters such as hydrophobicity of the surfaces, volume of the inoculum and time of culture define the resulting 3D-BC structures. Hollow spheres and convex domes can be easily obtained by changing the surface wettability where the BC grows. The potential of these structures as a 3D cell scaffold is exemplified supporting the growth of mouse embryonic stem cells within a hollow spherical BC structure, indicating its biocompatibility and future prospective. Hot off the press: First paper from Miquel and Pol! Written by Irene Anton on April 12, 2018 . Posted in New publications. Schematic representation of the two-step microwave-assisted synthesis of Au/TiO2 nanostructures. New publication from the N&N group in collaboration with the Universitat Politècnica de Catalunya! Congratulations to all the authors of the manuscript and especially to Miquel Torras (Ph.D. student at the N&N group) and Pol Sallés (previous researcher at the N&N group) for the first publication of their careers! The paper “Fast and Simple Microwave Synthesis of TiO2/Au Nanoparticles for Gas-Phase Photocatalytic Hydrogen Generation” has been published on April 12th 2018 at the open access journal Frontiers in Chemistry. Abstract: The fabrication of small anatase titanium dioxide (TiO2) nanoparticles (NPs) attached to larger anisotropic gold (Au) morphologies by a very fast and simple two-step microwave-assisted synthesis is presented. The TiO2/Au NPs are synthesized using polyvinylpyrrolidone (PVP) as reducing, capping and stabilizing agent through a polyol approach. 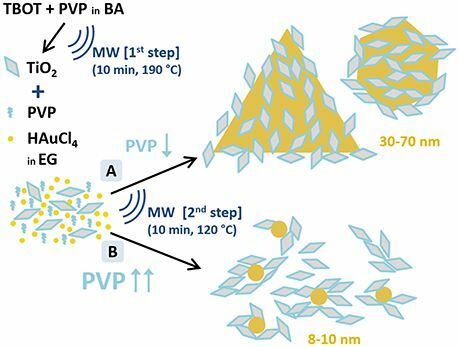 To optimize the contact between the titania and the gold and facilitate electron transfer, the PVP is removed by calcination at mild temperatures. The nanocatalysts activity is then evaluated in the photocatalytic production of hydrogen from water/ethanol mixtures in gas-phase at ambient temperature. A maximum value of 5.3 mmol·g−1cat⋅gcat-1·h−1 (7.4 mmol·g−1TiO2⋅gTiO2-1·h−1) of hydrogen is recorded for the system with larger gold particles at an optimum calcination temperature of 450°C. Herein we demonstrate that TiO2-based photocatalysts with high Au loading and large Au particle size (≈50 nm) NPs have photocatalytic activity. Written by Irene Anton on March 12, 2018 . Posted in General News, Group activities. Carlos Moya, a postdoc in the N&N group, had a good start into 2018 in terms of publications! On January he was coauthor of the paper “Probing the variability in oxidation states of magnetite nanoparticles by single-particle spectroscopy“ about his previous work at University of Barcelona. It was published on the Journal of Materials Chemistry.